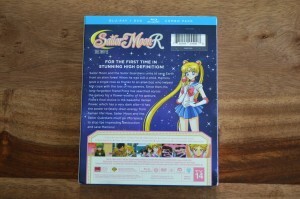 Sailor Moon R The Movie was released on DVD and Blu-Ray April 18th and it looks amazing. I’m not talking about the lacklustre cover art which everyone seems fixated on but rather the video quality of the actual Blu-Ray. This is a top quality release which seems to come from the film source. 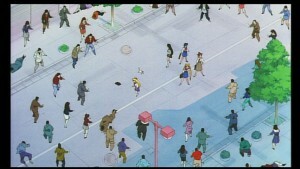 The level of detail is absolutely not something which could have simply been gotten from software upscaling, which is what has been used for all of the home video releases we’ve seen for the Sailor Moon TV series to date. But don’t take my word for it! Look at these screenshots to see the difference. 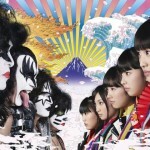 Prior to this release I watched the Japanese DVD as my gold standard. The French DVD release which came out in 2014 looks great too, but is still in the same ball park. It has a slightly cleaned up image and a higher resolution due to them having different TV standards. The old DVD we got from Pioneer in 1999 is borderline VHS quality, but it is an unmated full screen so there’s a bit more to the picture. This new Blu-Ray is in a league of its own. View the full sized versions of these pictures to see the difference. There’s a small amount of loss of quality from the JPEG compression on these uploads but it should give you a good idea of the difference. 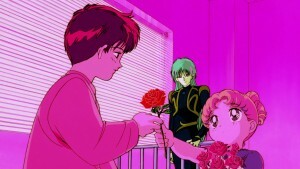 Pay attention to small details in the image like Fiore’s nose or the lines on Mamoru’s face. This new Blu-Ray image is not something which could have been extrapolated through software from any of the standard definition masters. This is a high quality HD transfer from film source and it looks as good as we could hope for! Fans who were lucky enough to have seen the film in theatres probably noticed that they could see a lot of detail in the image and we see that in this release as well. 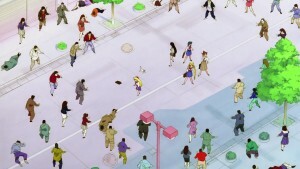 Look at another comparison between a wide shot of the street which gives us a lot of small details of individual characters. It’s really refreshing to see such a nice quality release from Viz considering some of the earlier stuff we’ve gotten from them. I’ve always said that they’re doing the best that they can with low quality masters and this seems to confirm that idea. They’ve gotten a lot of criticism for using too much post processing and such but at the end of the day if you start off with a low quality master there’s really only so much you can do to try to make it look nice. The minor differences between the different releases of the original anime don’t add up to much but this release is on another level. 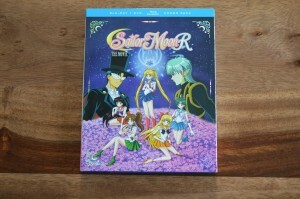 This is a great movie, part of the best of what Sailor Moon has to offer, and at the relatively low price it’s being sold for it’s a no brainer to pick it up. But wait, you’re all thinking, what about this terrible box art??? Indeed, the cover art isn’t the best. For weeks fans have been criticizing it. I’ll agree that it isn’t the best box art compared to their other releases but is that what’s most important? We’ve gotten a lot of really nice looking boxes with great little booklets and the video content always looked kind of terrible. Here we have the opposite, a box which isn’t that nice and a top quality release inside! All things considered I’d rather we get a release with a cover drawn by 3 year old with crayons if we could somehow keep getting quality releases like this! Let’s look at what else is in this release. First off is the feature, which is only 1 hour long. 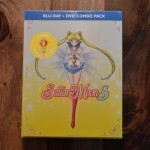 This is the first of the Sailor Moon movies and it includes both a new English dub by Viz and a Japanese audio track with English subtitles. 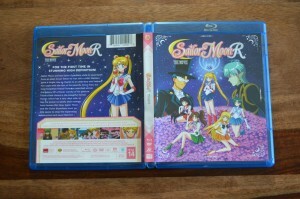 Sailor Moon R The Movie is one of my all time favourite films and my favourite of the Sailor Moon movies. It includes some of the best animation seen in the series. I watched the film in Japanese with English subtitles as I’d already heard the dub in theatres and found it to be good. Having seen a number of different versions of the film countless times I didn’t notice anything amiss with the translation, but as I don’t speak Japanese I can’t comment on it more than that. Also included is the Make Up! Sailor Guardians special. 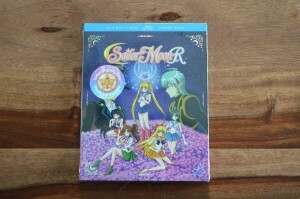 This originally aired with Sailor Moon R The Movie in theatres in Japan. It was also included in North American theatres when it played here. This is a fun little extra, running at only 16 minutes, with some new animation but mostly recycled clips from the TV series. This extra feature also looks great. 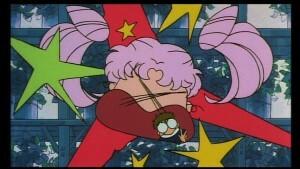 This makes me wonder what kind of masters TOEI had access to when they put it together! This release was obviously mastered from a film source but the TV clips included also seem to come from a higher quality source even than we’ve seen with the Japanese DVD releases. With the upcoming Blu-Ray release of the original Sailor Moon anime in Japan being advertised as being software upscaled from standard definition sources I wish they had access to the same source material they used in 1993 when this special was put together. Just look at this shot of Ami from her first appearance early in the first season with the fine detail in the lines. It isn’t the best but it’s nothing like what we’ve gotten in any other TV release of the series. Let’s hope the Japanese release we get in June looks something close to this! There are a few extras on this disc. 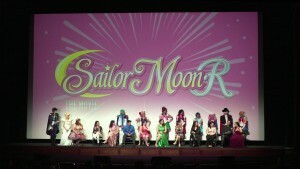 When Sailor Moon R The Movie played in theatres it was introduced by an interview with the cast. 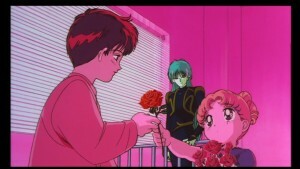 This included Stephanie Sheh, Sailor Moon, Ben Diskin, Fiore and Robbie Daymond, Tuxedo Mask. When I saw this in theatres I thought it was a bit silly to have it before the main feature. I was there to watch the movie, not see something which wasn’t more thrilling than your run of the mill DVD extra. Having it as an extra like this however is totally reasonable. This feature is about 10 minutes. 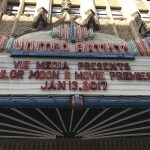 Also included is an interview which followed the LA Premiere. This included nearly all of the voice actors from the film, Viz’s Charlene Ingram and the ADR voice director for the film, Suzanne Goldish. The cast present included Carrie Keranen, the Xenian flower, Ben Diskin, Fiore, Cherami Leigh, Sailor Venus, Amanda Miller, Sailor Jupiter, Cristina Vee, Sailor Mars, Michelle Ruff, Luna, Sandy Fox, Chibiusa, Robbie Daymond, Tuxedo Mask, and Stephanie Sheh, Sailor Moon. 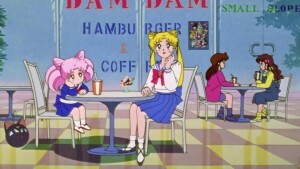 The only main actors not present were Kate Higgins, Sailor Mercury, and Johnny Yong Bosh, Artemis. The interview included your standard kind of banter about how mind blowing it is to see Sailor Moon the big screen and the fan reaction. Suzanne Goldish, ADR director, tells a humours story about how her notes had her flip flopping from calling the villain Fiole, which means nothing, and Fiore, the objectively correct character’s name and the Italian word for flower. This explains why the voice actors refer to him as Fiole in the pre-movie interview. ADR directors don’t have the star power of the voice actors but they usually have some good insight into the production which makes for interesting stories. Note that this book is not included with the film. There is also some character art on the disc itself. I wanted to grab some screenshots but this feature wasn’t included on the DVD and the tool I used to get Blu-Ray screenshots doesn’t support menus. 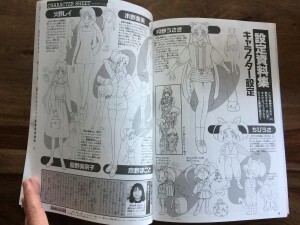 I’ll spare you photos of my TV and assure you these are character designs for the film similar to those seen in the above photo from the Japanese art book. It would have been nice to see a booklet with some character bios and maybe some of this kind of art but there’s nothing in the way of inserts with this release. 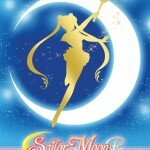 The Japanese Sailor Moon R The Movie art book includes over 100 pages of content. It would have been easy for Viz to put together 20 or so pages to accompany this film! We also get the standard trailers which are included in all Viz releases. If you haven’t been convinced to buy the remastered uncropped Ranma 1/2 Blu-Ray release at this point it’s just not going to happen. So what’s my final verdict? Isn’t it obvious? Just buy the movie! 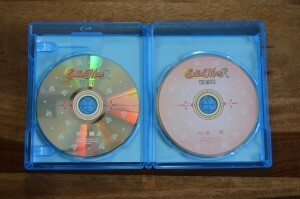 Don’t bother with the DVD as it doesn’t showcase the high quality video of the HD transfer. Buy the Blu-Ray which includes the DVD if you somehow don’t have a Blu-Ray player in 2017. I got mine on Amazon. You can also get it from other retailers like Right Stuf. If you don’t want a physical copy you can save a few bucks by getting it digitally on iTunes or Amazon Video, but be warned that the digital version is currently only available in English. This is a high quality release of a great movie which every fan should own. Go get it! Now that we’ve agreed that it’s worth getting whether you have another copy of the film or not a practical question is whether or not it supersedes any other release. Should you just throw your old copy out? The old Pioneer release has some advantages, mainly the old dub which some people have nostalgia for an the unmated full frame image. For most people in 2017 with widescreen displays this has limited appeal, but to this day the English release is the only way to get this full pictured version. 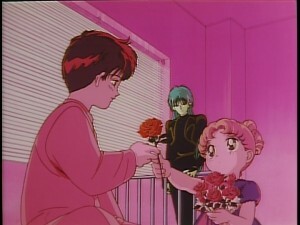 Even the original Japanese laserdisc version was presented in widescreen. As for the Japanese release it still has some special features which are nice. 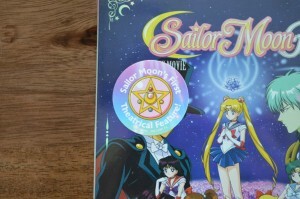 A rare DVD feature that all of the Japanese Sailor Moon movies have is an isolated music only track which is a nice addition which isn’t on this release. Keep reading for more photos. 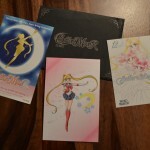 This entry was posted in Sailor Moon Anime (1992), Voice Actors and tagged Amanda C. Miller, Ben Diskin, Blu-Ray, Carrie Keranen, Charlene Ingram, Cherami Leigh, Cristina Vee, DVD, Fiore, Kisenian Flower, Luna, Michelle Ruff, Robbie Daymond, Sailor Jupiter, Sailor Mars, Sailor Moon, Sailor Moon R The Movie, Sailor Venus, Sandy Fox, Stephanie Sheh, Suzanne Goldish, Umino Gurio, Viz, Viz English Dub by Adam. Bookmark the permalink. It looks decent, because it was confirmed that the remaster work came straight from Toei, so it is not Viz job. Have a source for this? It certainly matches with what we’ve seen. Very unfortunate and I would hope they might dig them up but with the Blu-Ray release we’re getting in June if it hasn’t been cleaned up by then I’m not sure it ever will. The movie was pretty amazing! 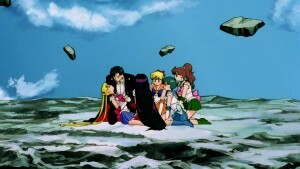 I hope they’re working on Sailor Moon S movie, where it first did Nehelenia’s theme song. Also, I hope for Super S, the voice actors will be Barbara Goodson (from FLCL and Power Rangers) as Zirconia, Roger Craig Smith (from Naruto and Regular Show) as Hawk’s Eye, Ben Diskin as Tiger’s Eye, and Lucien Dodge as Fish Eye. I hope we get information on Season 4 for Sailor Moon Crystal soon. And after Part 2 of Season 3 is released in June, and I wonder about the first part of Season 4 which Sailor Moon Super S? They just announced it was cancelled! I would cry if they really cancelled it. Won’t be surprised. Years ago TOEI worked on Rose of Versailles movie. After multiple delays of several years and even a trailer released, they abandoned the project without even bother to make an official statement. I’m very happy about this release’s video quality, yes. I was happy to pick it up. Um. I have an urge to apologize for a recent statement I made, regarding the cover art’s reveal. I said, “You’re not much of a fan if you refuse to buy this just because of the cover,” or something similar. I’m sorry if this offended anyone; it does seem smug and condescending. Like, “Who the hell made you the ultimate authority of the Sailor Moon fandom?” While I apologize for my clumsy wording, what I meant to say was, I don’t understand the logic I’ve seen some people elsewhere–not referring to anyone on this site, promise–who angrily announced their plan to boycott this release just because of some lousy cover. It is their decision, and they’re entitled to it, but I’m in the “I’ll take the release for the video alone” camp. I kid you not, my town’s only surviving video rental store (!) still has the Pioneer DVD available. I watched the new dub’s release in a theater, then rented that DVD the same night to compare. I love the boxart. The flowers on it give off very nice detail. Gives a romantic feel to it. 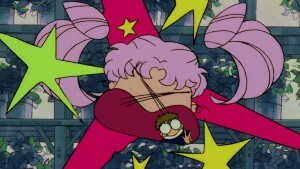 And that’s what Sailor Moon is, a romance anime. But I guess everyone’s entitled to their own opinions. Some people will like the artwork, some won’t. Can’t please all fans no matter what they do. 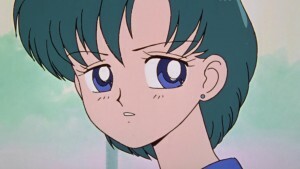 when will we hear news of Sailor moon Crystal season 4. Its been forever. I dont really like the new release especially if your used to the european italian remaster. 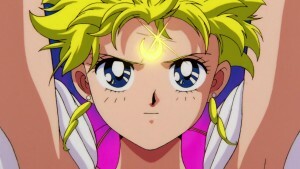 the colours are way too much espessially Usagi/Sailor moon’s hair its almost neon yellow. also at the beginning in the scene where usagi wants a kiss, on the right you see spots on her hair thats not supposed to be there….